So I’m just wrapping up a project where I had to generate PDF reports involving ArcGIS Server, ASP.NET MVC, and web services. I’ll do a post on how I rolled it all together later. But first, let’s look at this nugget… how to validate the PDFs being generated. The PDF library I used was iTextSharp, which was great. I would suggest getting the book “iText In Action” if you’re short on time (here or at Amazon). Otherwise, you’ll be doing more trial and error than necessary. Another valuable resource is the outdated tutorials. Ouch! That doesn’t look good. I wasn’t able to reproduce the issue using Adobe Reader or Foxit Reader. So I researched how to validate the PDF. iTextSharp doesn’t offer any way to do this, but the FREE trial version of Adobe Acrobat (9) does. 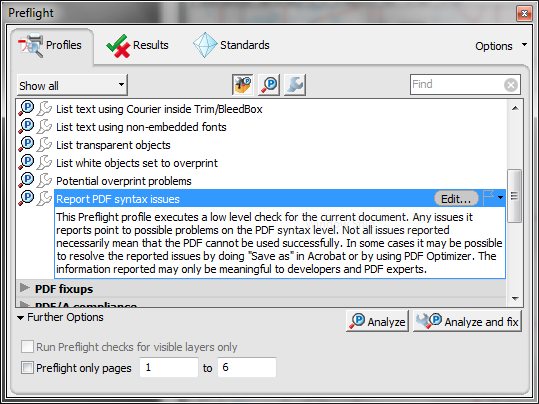 It offers the program Preflight which can analyze your PDF in all sorts of ways. 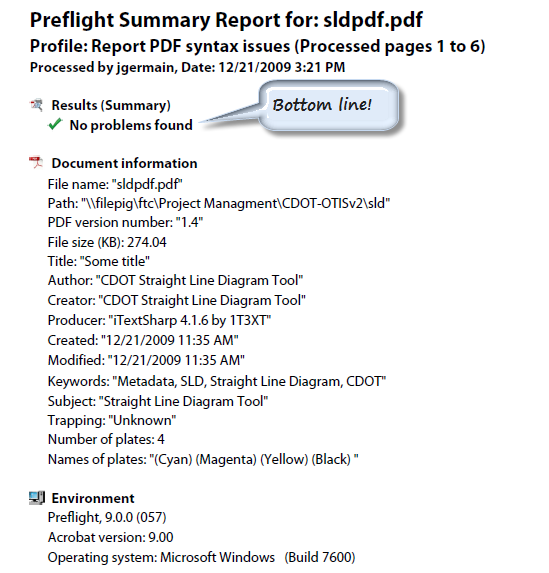 So I had my client send me a PDF they generated using our application which I analyzed using Preflight, specifically Report PDF syntax issues. Run this gem, then save the results to a PDF. I sent those results to my client. Turns out it was their installation of Adobe Acrobat. Doh! Anyways, a great tool and handy when generating PDFs using a low-level library like iTextSharp. I had to download the Trial version of Adobe Acrobat 9.